Websites powered by your homebuilding solution. Manage the new home sales process from lead to finished contract. Tightly control development budgets, from acquisition through delivery of finished lots. Manage your home construction projects from in the office or in the field. Integrated accounting from dirt to warranty with powerful reporting tools. Home inspections on a tablet; custom websites for your homebuyers. Customer experience leaders weigh in on the best methods for tracking and improving the homeowner experience. When 87% percent of home builders expect to earn new business through word of mouth referrals, excellent customer experience is not only a company attribute, it’s a success metric. The homeowner journey is the logical and emotional perception your buyers and homeowners have of you during the sales, construction, the home closing process, and long into home ownership. This means that customer experience is a team effort that needs to be planned and measured for effectiveness with your sales teams, your construction teams, your internal members and your warranty agents. Every company handles surveys and uses that information to learn more about themselves, their brand, and the product. Homeowner surveys are excellent ways to understand the complex and long process of bringing a home to market from the customers’ eyes. Customer experience professionals recommend at least 3 surveys: a survey during the construction process, a survey a few days after the home closing day, and a survey 1 year after home closing. The reasoning behind this is simple, the survey during construction is set to understand the worries homeowners might have about the plan for construction and your company’s overall sales performance. A survey after home possession is far more accurate than the day of home closing since it illustrates a genuine critique untainted by the excitement of getting their new home. The final survey is set far into the future after home closing, to get the homeowner thinking about you collectively and about how you handle warranty claims. By gauging your homeowners at the moments where they are most vulnerable, you can expect to get a true reflection of how your organization handles those key home building milestones critical to production. The image below helps illustrate the varying levels of homeowner satisfaction throughout their journey. Advanced home builders are indeed measuring their success by the weakest links in their process where the homeowners are most vulnerable. All team members should work together with the goal of “making your homeowners dreams a reality”. As a company, track and learn from comments in the surveys discussed earlier to gauge your employees. Great comments should be celebrated, and negative comments should be learned from and used as motivation for future sales and interactions. As leadership, making customer experience a discussion or a “nice to have” in your company culture isn’t enough. You need to implement a quantifiable way of measuring each members performance through the customer satisfaction surveys, as well as reward the key performers by giving them a higher stake financially within your company based on that performance. Instead of rewarding sales representatives who bring new business, realize all employees act as facilitators of the business relationship with homeowners. After all, your homeowners are likely interacting with many team members outside of your sales team. Giving your team members the right tools to serve customers is also crucial, the right to earn a homeowner’s referral is fermented long after the home is sold, built or owned. Homes today carry a hefty price and therefore homeowners mandate the builder be involved in fixing it for cases that are related to its manufacturing. Leaders in customer experience are known to have implemented technology solutions such as online homeowner portals for assistance with warranty claims. Popular with developers in the high-rise condominium business due to the volume of potential warranty claims in a smaller setting compared to a residential neighborhood, the concept can also be applied to detached communities and everything in between. Homeowner portals not only simplify your organizational method for warranty but also allow you to help your homeowners to help themselves first with an online manual. A little healthy competition doesn’t hurt! Getting together with your peer builders is an excellent way to exchange ideas and to further understand the different techniques home builders are using to make their clients’ dreams come true. The CustomerInsight Home Owner Mark of Excellence Award is an event that allows homeowners to publicly assess their builders and trades and recognize the best of the best. Although a company should strive to improve amongst itself, awarding the best of the best allows builders to share ideas, celebrate wins, and provides an industry benchmark to aim for year over year. The H.O.M.E. Awards is an annual competition that celebrates excellence in home ownership experience. Each year, the industry’s top home builders and trade partners are honored by their customers at this prestigious event. Winners of these awards are builders who strive to not only build beautiful homes for their customers but to ensure the best possible experience every step of the way. These builders represent excellence in both products and services in the residential building industry. The Awards are named after those who matter most, the Home Owners. Click below to attend this red carpet event and learn more about customer experience with your peers in home building. The residential housing market is healthy, but there will be obstacles during 2019. Prices for new homes may be slowing but there still will be a great opportunity for home builders with the right strategy for the upcoming year based on what builders have learned from 2018. Residential home builders and developers learned many great lessons in 2018. News headlines suggest that new home prices are declining but the market will still be competitive going into 2019. Coupled with advances in technology, the labor shortage affecting all blue-collar industries, and new emerging trends in home building – builders have many topics to consider for the coming year. Read the top 4 topics builders will face in 2019 and what builders need to know about them to prepare. In a thriving market, home builders may feel safe that their products are a sure sell, but as prices begin to cool and competition rises – you can bet your market competition is coming up with new ways to bring on new homeowners. Whether it is perfectly aligned construction schedules to maximize building efficiency or a customer experience that will have homeowners referring you to their friends and family, expect technology to become part of the solution. With a tight process, expect homebuilders to become more scientific with the way they do business, reports will become their best tool under their belts. For example, for your sales team – tracking monthly new home sales and upgrade sales by each sales representative could make for a competitive company culture. In regards to bidding and purchasing, perhaps establishing a report on costs for resource versus the cost of production could allow you to make better decisions when selecting vendors for your homes’ materials. In accounting, a high-level dashboard report for projected revenue could also become a critical tool for executives to understand the overall company performance. Assigning metrics to each building functions role will become paramount as home building processes take a methodical transformation, with home production optimization comes growth for the builder. For the complete guide on selecting and growing your building firm through integrated management software, read the complete “Homebuilder E-Guide: Selecting Management Software”. Construction and scheduling trades are critical phases in a home builders’ job. It is what brings homes to market for homeowners. The current state of affair for builders is finding the right trades who are committed and fair in terms of their compensation. Due to the lack of interest from millennials in the trades and their higher educational qualifications in comparison to their parents (baby boomers), expect the labor shortage to last a while unless the societal outlook changes on blue collar labor. Expect pre-fabricated housing to emerge as a staple supply chain asset for homebuilders. Manufacturing companies have already come into market and operate as factory line warehouses that manufacture the different parts of homes. The home frame, roof, panels, and decks will all become manufactured offsite and shipped to the lot for assembly. The role of operations managers and superintendents will become more paramount as their role becomes more logistics based than technical in terms of managing home builds. Interior décor and amenities for new home buyers have become the new expectations from building firms. Home buyers desire the experience of going to a home builders sales office and choosing the different finishes to customize their home interior. Managing these décor appointments also is proving to have taken an interesting turn for 2019. We are seeing many new technologies appearing in design studios, virtual reality has been a tool to showcase alternate finishes to homeowners, we are seeing tablets and mobiles used for quick spec lookups on products. Even the main process has become automated, the focus is now on homeowners and their wishes. As interior décor catalogues become digitized, digital product libraries are helping builders serve contracts to homeowners quicker than ever. For the complete guide on design studio trends developing in the residential homebuilding industry, read “Top 2019 Design Studio Trends for Homebuilders”. Although the headlines regarding real estate costs are telling us there will be a slowdown in the housing market, the market itself is steady and great for business. There are few factors at play here, Americans are generally feeling good with their job security, the employment to builder permit ratio is above average across the country, and millennials are also entering the homebuyer market and surprisingly choosing to move farther out from the main city’s and selecting smaller entry-level homes in comparison to their parents, the baby boomers. The vacancies in trade jobs have allowed trades professionals to capitalize on the job crater. This intern is driving up costs for builders and ultimately home buyers. Although prices and new homes sales are decelerating don’t expect the market to collapse! During a market like this one, it is time to consider all facets of the business of home building. Customer experience is no longer optional but an edge that will determine which builders gain control of the various markets. Process becomes crucial and the technology driving it as time becomes of the essence during construction, the lack of skilled labor will also pose a choice for builders as their trade base evolves to include wholesale building material manufacturers. One thing can definitively be said, this market will require creativity and commitment to all facets of home building. For 2019 residential market statistics and opinions from building executives – watch the webinar on “2019 Industry Predictions and Building Trends”. The market is healthy for homebuilders but there will be challenges along the way. Regardless of the challenge, whether it is dialling in a steady construction process, optimizing building strategies to bypass the lack of available trades, or optimizing your customer experience and product selection to cater to the wishes of homeowners. Builders will need to get creative in the business, embrace innovation and technology, and keep homeowners at the forefront of everything they do. 87% percent of home builders expect to compete in their market based on customer experience, here are immediate tips to align your company mission correctly for increased referrals. With 87% percent of home builders expecting to earn new business through word of mouth referrals, excellent customer experience could be the new frontier for home builders to improve the way they do business. Although there is a surge in new home sales demand and the home builder’s willingness to compete through customer experience, how well equipped are home builders in handling homeowner demands? Citing a popular study from The North American Homebuilders Association, it is evident that while home builders have made investments in technology to improve their overall operations, the same can’t be said for tracking customer satisfaction with home builders at an 18% adoption rate nationally. On the other hand, giving homeowners the ability to monitor their home construction is also at a low 22%. Read the following tips to immediately change how your company handles the homeowner journey and improve company ratings. This first tip is powerful as it can be implemented into your sales and customer care process immediately. While a concrete sales process from outside sales to interior décor upgrades is critical to the bottom line of your business, training your realtors and sales on a human approach is key to winning their hearts and earning their referral. NAHB also cites that a homebuilder’s referral market often constitutes 80 percent of their new sales. Therefore, the way we approach potential home buyers needs to be optimized. Train your sales team to build a rapport with new homeowners, keep them in check during all steps of the building cycle, and answer their calls and requests promptly. For example, during the sales and decor appointment, train sales to understand the type of family or homeowner they are selling to, understand their budget, and what they are comfortable with in terms of upgrades. For example, if they are a young couple looking for their first home, perhaps these homeowners are willing to sacrifice home space but will opt-in for better amenities such as high-end appliances. Another example is serving a family with children, this type of prospect might look for upgrades around the home that revolve around family gatherings such as a kitchen island, child-friendly appliances or perhaps more lot space altogether. All this will improve the products you serve them, and the amount of time second-guessing is reduced in your sales discussions. Consider creating content for your new home models with applicable home interior upgrades to allow your homeowners to create a mental Wishlist of what to expect when buying from you, try to build these upgrade packages based around your ideal types of homebuyers and sell that lifestyle. A home reflects the owner’s desires and lifestyle, by closely reading what selections they are gravitating towards in the décor appointment, you can make educated guesses to the styles they may also prefer. At any given moment in the sales process or at the design center, always prioritize the comfort of the customer based on their desires. Communication is key during the sales, construction, interior decors appointments, and during the big day that is home closing. But the Homeowner journey does not end there, one of our clients Lokal Homes, a builder ranked 138 on the top 200 builders list, has a pre-established roadmap for all their sales and warranty professional abide by. You will notice that in their roadmap, communication does not break off from homeowners after the home closing, as a matter of fact, their employees are encouraged and incentivized to promptly follow up in a form of a letter or satisfaction survey post-home possession. The moments beyond the home closing are when homeowners tell you the truth about your builder brand and whether you can count on their referral. In the last couple of years, we have observed the home builders leading the way in customer experience pay close attention to their negative reviews first. These builders turn their negatives into a positive to increase their customer rates and referrals. They also have a standardized customer journey assessment process and implement surveys before and after home closing. To get qualitative and quantitative results, they measure success and homeowner’s dissatisfactions over a period and learn from the feedback. This can also become a powerful motivator for your team members, incentivize your sales and customer care representative to go above and beyond for homeowners. Reward great performance and improve poor performance. To learn more how production homebuilders are reviewing, assessing, and reorienting their process to suite a positive homeowner experience, try “Builder Interview with HoneyField Homes”. Many consumers claim that they are willing to switch brands if they find that the company is unknowledgeable or unable to serve their customers. Home building is the same! But in our industry, failing the customer could mean the loss of a future referral sale. Ensure your team is trained on all your products and that all your interior upgrade packages have warranty information that is easily accessible by homeowners. Some of the clients who are on national heights have even invested in homeowner care portals also found as part of our CustomerInsight suite of solutions. Follow the link to learn more. 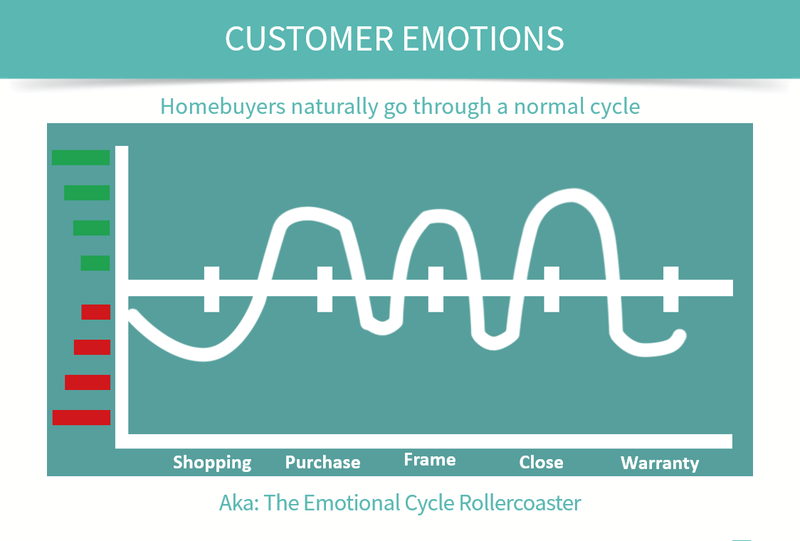 Being emotionally involved first with your homeowners during your sales and warranty process is key to attracting and nurturing homeowner relationships that translate to referrals and more sales! Establish a road-map for your sales, construction, and customer care processes where your homeowner will receive critical updates from a selected representative of your company. Keep your client facing teams armed with product knowledge and customer first with the right incentives. Track and monitor your performance as a company and on an individual level, celebrate wins and learn to change your process for reoccurring issues. Finally, allow your homeowners to have accessibility, homeowner warranty tools can limit stress on your claims department and allow your homeowners to feel safer and self-sufficient. Homebuilder Management Software is a tool designed to improve productivity, enhance efficiencies, and streamline operations for a residential construction company. Selecting this software is a decision that will impact your business for years to come. Before reaching out to software vendors, it is important to establish your goals and requirements. The following steps are designed to help home building companies identify which software is best for managing their business and which technology partner can support their goals and company structure. For the full e-guide, try reading “A Step-By-Step Guide to Selecting HomeBuilder Management Software”. By establishing what your company is currently lacking in terms of process and what your company already does successfully, decide on an overall goal. That goal may include increasing revenue and profitability, improving communication between the office and the construction site, enhancing accessibility during project management, increasing employee productivity or even increasing customer satisfaction. The timeline should be your company’s second step. Highlight key moments in this timeline including the research phase, the software provider review phase, when a final selection is needed, and when the implementation process needs to conclude. This will ultimately guide the software provider in seeing which integrated solution is best for your company, and what is the best possible method to implement the software to fit the structure and goals of your company. Selecting a Homebuilder Management Software system requires careful thought and consideration. All companies are different, and therefore requirements will be unique. First, document your company’s processes and identify unique systems as well as strengths and weaknesses. Then determine how technology can address these processes. Try to identify these requirements across all your core business functions including land development, purchasing, sales, accounting, construction and warranty departments. Beyond that also think big, how many homes did you produce this year versus how many do you hope to accomplish the next? Does this system function for single or multifamily communities? By determining what the requirements for your business will be, you can effectively mitigate risk and ensure all avenues are considered before proceeding with your software purchase. Take the time to truly get to know the vendors available and the market. Look beyond the software to determine what each vendor is about. Consider building relationships with your final options, after all, selecting an integrated home builder management solution is essentially a company partnership. To ensure a vendor can help your business succeed, ask to read their case studies, watch product videos, and speak with customers currently using the Homebuilder Management Software. Ask the vendor for as many case studies, videos, and references as possible that relate to your specific business or industry. With the vendor’s references, you need to ask the hard-hitting questions. Regardless if you feel the answer may be negative. All aspects of a software system and a technology partner will influence the trajectory of your company. Ask about the overall implementation process, was training provided by the partner? Why did they choose this vendor? And what are the overall benefits to their system in comparison to others? By asking these questions of the reference, you should be able to gauge how the vendor performs, as well as the results you should expect by implementing the Homebuilder Management Software. Once you have selected a vendor and are confident they can meet the needs of your business, you are ready to start the implementation process and begin your partnership with the vendor of choice. The ideal implementation process should begin with a kick-off meeting where the vendor will gain a better understanding of your business’ needs, determine the launch date and discuss best practices during this phase. Again, a great software provider will look at your current business processes, identify what is currently working then identify areas of deficiencies against the industry standard. Training services are also a must from a software provider, digital literacy skills must not be taken for granted especially for a specialized solution that is specific to home building management. Before launch, see if your software vendor can set up work scenarios to self-train your employees before real life building tasks occur. With a gradual buildup of the software solution and slowly easing into end-user adoption, you will surely succeed with your software selection. The software selection process for homebuilders is a great time to solidify your company’s trajectory. Choose a strategy, establish a timeline that fits your all your system requirements for your core business, explore your vendor options and their software, then finally, commit to your system with a trusted partner. As a full suite software provider for home builders, contact us for a business review, you can also read the full software selections guide. If you are unsure if enterprise resource management software is a worthy investment, find out how much other builders are saving in terms of time and resources. What’s new this year at Build Smarter 2018 Conference? This year’s conference in Nashville will be Constellation HomeBuilder System’s biggest turn out to date! What’s different about our 2018 conference is our session diversity. In previous years, our conference has mainly been for training customers on our software. This year, we have gathered the best industry experts to speak about the latest building trends, market data, and the future of homebuilding. We are introducing a new Builder University sessions track, which will be presented by top builders to share best practices. We are also bringing the largest customer care & professional services team to date! Drop by our tech lab for any software questions you might have. Also, make sure to join user groups led by our software specialists to impact the development of your software solutions. Our highly anticipated university sessions include DSLD Homes as an event to surely attend. DSLD Homes is famous for mastery of even-flow scheduling of their construction team and their trades. Learn from an industry leader how they bring a home to market in just 43 days! Another anticipated session presented by our sponsor Meyers Research will discuss national housing market statistics in hot markets and what it means to a builder’s strategy. You can also drop by our Builder Roundtable on “What Customer Experience Means to You”, where we discuss the importance in the Customer journey for homeowners during the sales cycle. We are also including home builder university sessions exploring future developments that include predictive homebuilding powered by artificial intelligence and the trend of perfricated housing and what it means to the overall process of homebuilding. University sessions are perfect for gaining best-practices in building and learning about future trends in your industry. At Constellation HomeBuilder Systems, we develop our software with functionalities our builders demand. Attending your software user groups ensures you are part of the discussion on how we can best serve you to build more homes. The user groups are also the best time for us to reveal our 2019 product roadmap! Ensure your voice is being heard by telling us key performance areas you wish enhanced. After all, you are an expert in building and we want to learn from you as well! We added more user groups this year. Make sure to arrive promptly on October 3rd. User groups for NEWSTAR, FAST, BuildTopia, LandDev, and Design Studio Manager will be held live at 4 PM immediately followed by our cocktail reception in the main ballroom! See how Design Studio Manager software works in real life! Improved Tech Lab for All Your Software Questions- Drop by, Anytime! Our Customer Care & Professionals Services team are excited to meet you! Our tech lab is back better than ever, from setting up sales campaigns to creating on-demand reports, our experts have you covered. Visit our tech lab to meet one-on-one to have your software questions answered. Our professional services team will also be present to take on any product enhancement requests. Our tech lab is a great way to get hands-on support from our customer care team, so you can walk away with key tips from our experts on how to maximize your software value. Our marketing team has been hard at work the past few months securing the right speakers and builders to join us to bring you sessions that will truly impact your business towards success. Whether you are attending the user groups to see how you can influence your software or interested in the general education sessions from our builders, we are sure you will find something useful to implement in your business after your Nashville trip that will positively impact your company bottom line. Join us with +300 home builders from across North America. Register Today.